Why Wear Finger Cots When Handling Coins? In the fascinating realm of coin collecting, there is certainly one very important, fundamental, and iron-clad rule when it comes to handling coins. As any coin collector worthy of the name will surely attest, there is nothing more distressing or even annoying than to set one’s eyes on a stunning uncirculated or proof coin with unsightly if not downright revolting fingerprints ruining its surface. Numismatically speaking, it is close to being a disaster, and positively irresponsible, and certainly preventable. Obviously, almost every coin collector relishes the notion of taking hold of a ‘raw’ coin with their bare hands, but holding a coin incorrectly can leave behind minute traces of improper ‘human’ contact that cannot be easily removed without the risk of damaging the coin even further. Over an extended period of time, that damage accumulates, and all of it could have been avoided if everyone who happened to have taken hold of that coin took a few simple precautions. The key preventive measure is to handle any coin only when it is absolutely necessary. It is critical to keep from touching the surface of any coin, no matter what its condition might be, to prevent the probability of causing any unnecessary wear, or transferring damaging substances that could produce spotting or discoloration to a coin’s surfaces. The best preventative safeguard would be to make sure your hands are carefully washed with hot water and anti-bacterial soap, and thoroughly dried before any contact with a coin takes place. By simple or inadvertent contact alone, fingerprints can decrease a coin’s grade, and therefore, its value as a collectible specimen. Human skin, and consequently, human fingertips, invariably contain oils of a highly acidic nature that can cause serious damage on the surfaces of a coin. The presence of moisture, oils, salts, and various types of bacteria on human skin has the capacity to corrode the metal coins are made from. Fingerprints left behind on a coin may not reveal themselves on the coin’s surface immediately, but when they do eventually appear, the harm has already been done. The fingerprint will reveal itself much like an etching on the surface of the coin, and will undoubtedly need to be removed with a chemical solution or cleaning agent, if it is still possible to be removed at all. By any measure, it is important to handle any coin or other numismatic collectible by its outside rim, or the ‘third’ side, between the thumb and forefinger. However, the most preferable method for handling any coin is either with light cotton, latex, or nitrile gloves, or with the much more versatile finger cots. 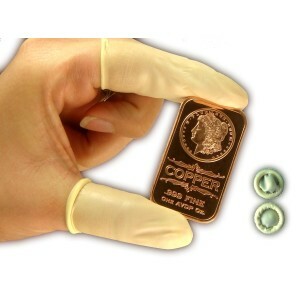 Finger Cots are ideal for handling any type of coin when a full glove is not necessary. There are a host of finger cots on the market, not only for coin collecting purposes, but for environments such as cleanroom, electronic, industrial and medical applications. Most types are both anti-static and powder-free, and are available in cotton, latex, and nitrile materials. They are the perfect answer for minimizing the corrosive effects of perspiration, body oils, salts, and even hand lotions on coin metals. They are also convenient when using any type of cleaning or preservation solutions on your coins, along with keeping those often caustic cleaning substances from getting on the skin. Using finger cots provides the all-important ‘feel’ when touching the coin, without the need for gloves, and wearing them is like wearing nothing at all. The most popular type of finger cots are the disposable, 100% Natural Latex Finger Cots that allow you to handle your coin collection without the risk of ‘etching’ them with damaging fingerprints. They are very quick, easy and convenient to use by ‘rolling’ them out over your fingers. They generally come packaged in quantities of 50 individual finger cots, and in regular or large sizes. When it comes to one of the most inexpensive coin-handling tools out there, nothing beats the finger cot for preventing the most damaging or destructive elements to anyone’s valuable coin collection – the human fingerprint.